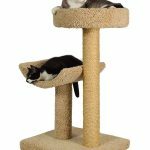 This cat tree is of the highest quality, and if you want to spend the money for the best, this is the best. 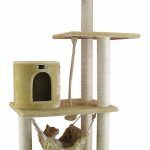 The cat trees from Molly and Friends are handmade and they are shipped to you fully constructed. This is a very solid, quality cat tree and it shows in the details. The construction is not modular, it is built with full wooden poles. Sisal wrapped scratching posts give your cats the best scratching surface available. Thick carpet covers everything else, and you’d be hard-pressed to find a seam or glue anywhere upon inspection. Even the bottom of the platforms are carpeted. This is one of the things that makes you feel like this is one very high quality cat tree. One thing that makes this cat tree stand out from others is that all the platforms are all large and sturdy. It’s got plenty of room for your cats to lounge and stretch out, which is what they do most of the time anyways! People who buy this cat tree swear that it is the best quality cat tree that they have owned. This is often an upgrade purchase for someone who has had another cat tree for a while. Comments regarding shipping? Everybody says that the box is huge and that it was bigger than expected. I even found one comment where they said the box looked like it was for a fridge. Even though it’s big, everybody seems to say that it’s easy to move or slide around. It’s sturdy enough that it can be dragged without having to worry about damaging it. It won’t creak or buckle at all. People say their cats love it! It’s big and good for big cats that like to stretch, with many people who own big cats being very impressed with how much their cats like this cat tree. How sturdy is it? Buyers say that their big cats can jump on this tree and abuse it just as much as their small cats do, and it won’t wobble or tip at all. In fact, overall people are very impressed with the great sturdiness of this cat tree. How about the scratching posts? One buyer said that their cats completely stopped scratching the furniture once they got this cat tree. The scratching posts were very appealing to their cats. Sisal rope wrapped on wood provides cats with a better scratching experience than furniture probably will, which is the reason for it’s effectiveness. Overall, buyers are very happy and there are really no complaints at all. 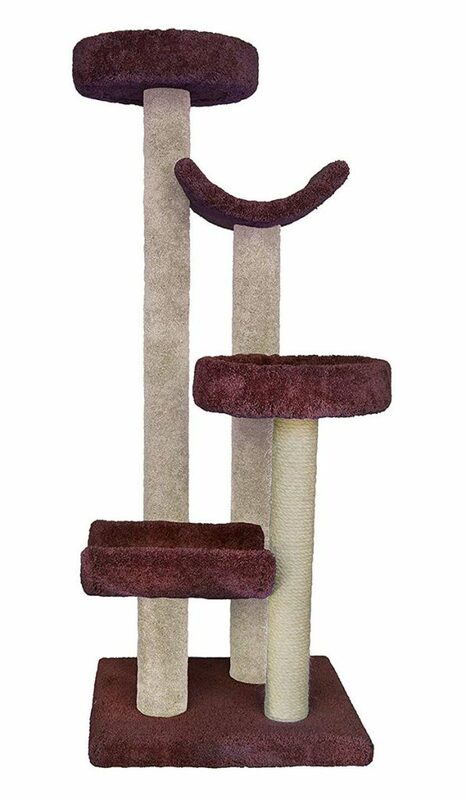 You are going to get handmade, wooden cat tree wrapped in high quality carpet and sisal. And your cats will love how sturdy it is and how comfortable it is. If you want the best cat tree, this is a good pick. I do find that this is probably the best one out there online to buy. I had researched many. I think that what sets this apart is the handmade feel. It just feels like somebody built it to be the most solid thing they could build. I appreciate the effort on the quality. And the cats do. This looks so unspectacular yet it is so awesome I like it so much. The carpeting is some of the best that I’ve had on any cat tree that I’ve had, it’s put together much more better than the ones at Petco or places like that where I’ve seen the carpeting just sloppily stapled to the bottom of the platforms like it’s not that big of a deal. I like these because they wrap the carpet over just about every place they can find to wrap carpeting over.